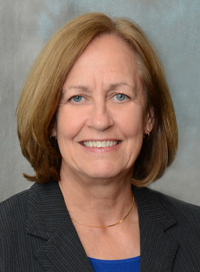 Sandra Larson, systems operations bureau director, Highway Division, at the Iowa Department of Transportation, is the 2016 recipient of the Roy W. Crum Distinguished Service Award from the Transportation Research Board (TRB). The honor recognizes her achievement and leadership contributions with both TRB and the American Association of State Highway and Transportation Officials. Larson served on more than 20 TRB committees and held a number of leadership positions on committees designed to foster collaboration and innovations in research. In 2011 she was named a National Associate of the National Research Council of the National Academies of Sciences, Engineering, and Medicine. In her role at the Iowa DOT, Larson collaborates on many ongoing projects and programs with the faculty, staff, and students at Iowa State University’s Institute for Transportation. The Crum Award, which will be presented January 11, 2017, during the Chairman’s Luncheon at TRB’s 96th Annual Meeting in Washington, D.C., recognizes outstanding achievement in the performance of distinguished service; the production of fundamental or developmental research; or the administration, promotion, or fostering of outstanding research. The award was known as the Highway Research Board (HRB) Distinguished Service Award until 1952, when the Executive Committee re-designated it the Roy W. Crum Distinguished Service Award as a memorial to the Board’s director, Roy W. Crum, who served as head of the HRB staff from 1928 until his death in 1951. TRB is one of seven program units of the National Academies of Sciences, Engineering, and Medicine.